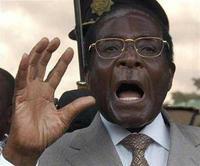 “It is a shameful episode for Europe that President Mugabe is to be feted in Lisbon. “Whilst I support the Prime Minister’s decision not to attend, now that Mugabe is there, it is important that Baroness Amos, the Minister representing Britain, lays his crimes bare before all those attending. “The British people will want to know that these points have been made and that every leader attending the Summit from Europe and Africa has had to take heed. Mugabe should not go home without being made to feel deeply uncomfortable and those who welcome him should not go home without feeling ashamed." Hague won loud applause at party conference in Blackpool when he not only called for tougher sanctions on Zimbabwe but for Mugabe to be stripped of his honorary knighthood. In violent attacks on the opposition between March and April 2007, the regime arrested or abducted 600, hospitalised 300, and killed three.